LV.Net SEO Services include search engine optimization and search engine marketing strategies designed to increase targeted traffic to your website. SEO is a structured curriculum for new and existing websites that promotes increased visibility of your site in search results pages (SERPs) from the top search engines. Many websites include ecommerce and online shopping cart functionality. 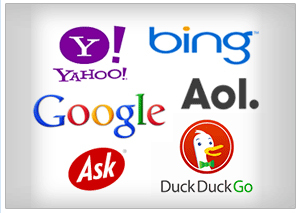 These sites can benefit from our search engine marketing (SEM) services to accompany ongoing optimization efforts. Whether your website was designed to provide information, generate sales leads or to sell a product or service, unless your website saturates the major search engines results pages, it will likely never be seen. The LV.Net SEO and Marketing Team objective is to provide clients with measurable improvement in placement and ranking, both in organic (unpaid) and paid (Pay Per Click) search engine results pages. LV.Net uses only natural, acceptable Internet marketing practices to ensure your traffic grows in a manner that is sustainable, consistent and affordable to maintain. Search engine optimization is a systematic, sustained and progressive effort to manipulate the variable characteristics of a website to improve search engine rankings. Ranking high in major search engine results for topic related keyword phrases is the ONLY way your website has a chance at succeeding on the Internet. LV.Net makes use of an industry-current toolset for conducting market research, analysis, observation, and comparison to formulate the most effective optimization strategy for your website. Our Las Vegas SEO team blends the expertise and experience of web developers, graphic designers, Internet marketers and copywriters to implement genuine improvements to your website. There are many major factors that determine your sites rankings in the top search engines. Our SEO strategies are customized around every websites individual needs. Search engine optimization will bring an improvement in quality to your site that will be evident to both your visitors and the top search engines. Search engine marketing can add immediate profitability to your web-based business by way of the Pay-Per-Click advertising offered by Google, Yahoo and other search engines. LV.Net search engine marketing services combine the benefits of organic SEO with managed PPC campaigns to meet your specific goals and objectives. Our Internet marketing consultants will assist you in developing the most effective Internet marketing strategy for your website to ensure measurable improvements in traffic and conversions. Regardless of budget, SEO can be affordable if you are willing to shop around for the best prices, and focus on only the optimization needs that offer the most substantial benefits. Implementing a managed Pay Per Click advertising campaign around your products or services can offer immediate profitability for your website that can offset the initial investment required for professional search engine marketing services. Competitive analysis performed by a specialist is the best way to size up your competition, and develop a successful niche marketing strategy. The money invested in organic search engine placement has long-term, effective promotional benefits that cost very little to maintain. A complete range of services eliminates the need for outsourcing. Getting started with your custom website marketing plan is easy. Fill out our online form and we will contact you regarding an online marketing plan that is customized for your website.